Managing the different sources available today is an increasing challenge not only for cost or regulatory compliance but also due to the volatility. The EMS solution of MAS is a suit that covers all of today’s needs when managing the load & energy mix of a power grid Developed on the Across® platform, the EMS solution of MAS provides also the advantage of the latest IT technology which ensures its capability and capacity to embrace the future developments in the power production sector. SCADA, dashboard and reporting capabilities needed to provide real-time management of all type of power sources and/or power producing installations. Power capacity forecasting algorithms that take into account a wide variety of factors including weather projections & MMS data. Grid requirements forecasting algorithms that take into account several factors including weather, historical data and AI. Key functionality required to provide and to implement generation schedules covering the optimized energy mix considering the market, the forecasting projections, and the regulations. Completely new and interface to properly manage renewable resources, distributed energy storage and hybrid plants. Special algorithms to project the volatility impact capacity from small scale (unmonitored) power sources like small solar plants. Multi-area / multi-market generation control and dispatch. Grid / Installation performance monitoring. Operational interfaces to the MMS, GMS and DMS and billing systems. Detailed historical archiving which provides transparent data for both the regulator and producer. One of the prime concerns of today’s power market is the support the production of green energy while maintaining Energy Availability, Affordability, and Quality as well as Grid Discipline. MAS EMS provides the unified real time monitoring and control of all available energy sources in a given Grid or area and thus the ability to maintain the optimum balance of the energy mix. Managing renewable sources to ensure sufficient energy reserves but also nominal frequency and voltage is a difficult task due to the production volatility of wind and solar sources. The challenge in small Isolated grids is much bigger due to the limited time & capacity to react and correct anomalies. Rolling Energy Scheduling for hour & day ahead. Meter Data Acquisition for monitoring and accounting. Energy Accounting for the area / grid. 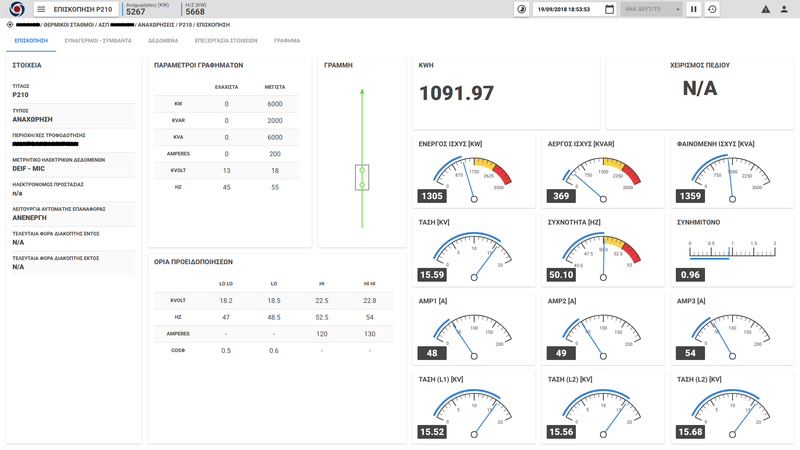 Real time monitoring of the power dispatch scenario within the controlled area. Complete integration with MAS’s GMS offering live production management also. Alarms on regulatory non-compliance and deviations. Web based interface for monitoring, reporting, analysis work flow interactions required with various stake holders. Advice to the user based on which the user can instruct constituents to act accordingly. Adhere to Wind, Solar, storage and hybrid regulations.